In 1983 the Countryside Mennonite Fellowship near Hawkesville explored the possibility of colonizing a non-Mennonite area and establishing a congregation. The choice settled on the Tara, Ontario area. In early 1984 a suitable building on the south end of Tara was purchased. In May 1984 Abner Martin was charged with pastoral leadership of the new group. In June 1984 five families located in the community; the first services were held that summer. A Christian day school was launched in September 1984. In 1998 the congregation built a new building, and a facility for the Glad Tidings Christian School which is also operated by the church. The congregation's membership stayed with the Countryside congregation before it became an independent congregation. Glad Tidings has been affiliated with the Midwest Mennonite Fellowship since its beginning. In 2014 the congregation's ministerial team included Bishop Rodney Weber, Ministers Abner Brubacher and Michael Martin, and Deacons Arliss Brubacher and Cleon Weber. Brubacher, Abner. 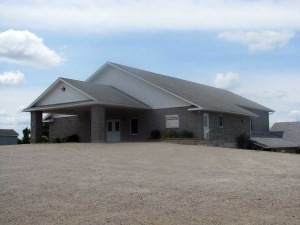 "Glad Tidings Mennonite Church, Tara, Ontario." Midwest Mennonite Focus 6, no. 6 (November-December 1985): 8. Steiner, Sam. "Glad Tidings Mennonite Fellowship (Tara, Ontario, Canada)." Global Anabaptist Mennonite Encyclopedia Online. February 2015. Web. 21 Apr 2019. http://gameo.org/index.php?title=Glad_Tidings_Mennonite_Fellowship_(Tara,_Ontario,_Canada)&oldid=140080. Steiner, Sam. (February 2015). Glad Tidings Mennonite Fellowship (Tara, Ontario, Canada). Global Anabaptist Mennonite Encyclopedia Online. Retrieved 21 April 2019, from http://gameo.org/index.php?title=Glad_Tidings_Mennonite_Fellowship_(Tara,_Ontario,_Canada)&oldid=140080. This page was last modified on 8 November 2016, at 22:42.